Christmas almost here and love is all around! The best season to share our most romantic feelings. Below you can find many sweet and romantic Christmas wishes and text messages to share them with the one you love! ♥ The only thing I want to unwrap under the Christmas tree this year is you. ♥ Baby, you put the jingle in my bells and melt the ice around my heart. Merry Christmas! ♥ When I am with you, I feel like all the joy in the world is mine for the taking. ♥ I can think of nothing more romantic than Christmas Eve in front of the fireplace with you at my side. ♥ I must have been a very good boy/girl this year because Santa brought me you. Sweet merry Christmas! ♥ You are my shining star, and I thank God every day that he hasn’t sent you to heaven where you belong. Merry Christmas baby! ♥ Here is just the smallest token of my love because nothing I could give you could ever measure up to how wonderful I feel when I am with you. ♥ You are the only wonderland I want to explore be it winter, spring, summer, or fall. ♥ Who needs Christmas carols when you and I already make the sweetest music possible. ♥ Merry Christmas to the one woman who makes me feel like a king all year round. ♥ May all your Christmas wishes come true because you have made all of mine a reality. ♥ Our time together is a blessing from which I never want to recover. ♥ While this is our first Christmas together, I pray it is just the first of many. ♥ No lights twinkle as brightly as the love in your eyes and no candy cane is as sweet as your kisses. ♥ You are the love that makes our house more than just a home during this holiday season. Merry Christmas baby! ♥ You are the Christmas angel who makes me the luckiest man on Earth. Thank you for everything you do. ♥ Everyday that I wake up next to you, I feel like a little kid experiencing his very first Christmas. ♥ Best wishes to you during this holiday season because you have made all my wishes come true. ♥ If I could ask Santa for just one thing for the rest of my life, it would be you just the way you are right now. Merry Christmas baby! ♥ Thank you for being the sweetest treat any man could want this holiday season. Cheers! ♥ When I think of Christmas, I think of the scent of your perfume, the smile on your face, the sound of your laughter. ♥ Merry Christmas to the only woman for me. You are the soulmate I’ve sought my entire life. ♥ Babe, tell Santa he can skip our house this year. You are the only gift I need. ♥ Feliz Navidad to a woman so hot that you could melt Frosty down to his carrot in top hat in record time. ♥ All I want for Christmas is another day to prove myself good enough to have a woman like you in my life. ♥ Baby, it is cold outside, but I am warm in here with love for you. ♥ May you have a fairytale Christmas filled with as much love and laughter as you have brought to my life. ♥ Sweetheart, I want to grow old with you one snowy Christmas at a time. I love you. ♥ My love for you shines brighter than all the Christmas lights on the tree and will last as long as the legend of Santa Claus. ♥ I can buy you diamonds. I can buy you gold, but nothing is more precious than spending time with you. ♥ Santa said you were looking for someone special this year, and he sent me you. I hope I haven’t let you down. Merry Christmas Baby! 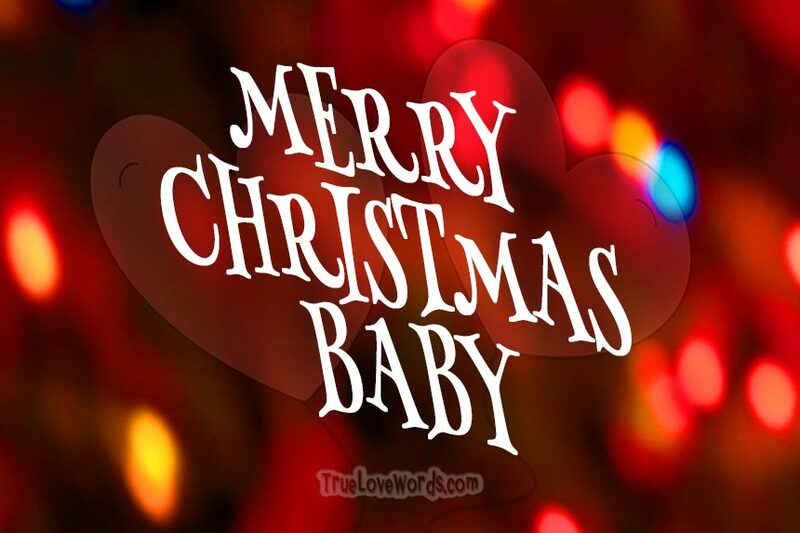 ♥ Dressed in ribbons and tinsel or a burlap sack you are still the best gift under the tree. ♥ Happy holidays to the one woman who makes me feel like a whole man every day of the year. 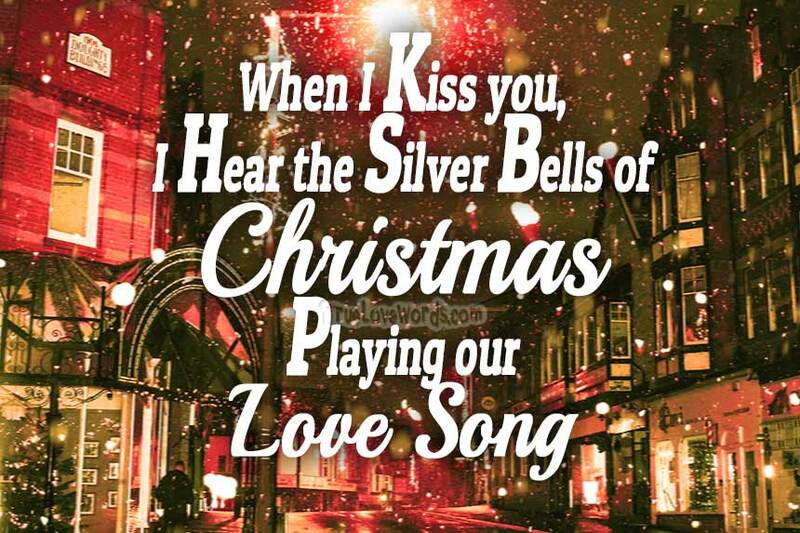 ♥ When I kiss you, I hear the silver bells of Christmas playing our love song, sweetheart. ♥ It may be Jesus’ birthday, but I am the one who received the best gift. I got you. ♥ You are the Christmas cheer in my cup, the sweet candies in my stocking, and the reason for the season of love. ♥ Sharing a Merry Christmas with you is the one surefire way that I will have a Happy New Year. ♥ The Christmas stars in the sky pale in comparison to the all the love I have for you. ♥ My dear, may this season be the best one ever because we are together and in love. ♥ To my dearest, you are the angel who makes everything worthwhile. May the season bring you all the happiness you deserve. ♥ When Santa comes down the chimney tonight, I’ll be waiting to shake his hand and thank him for bring me you.